Does This Site Qualify as Bigotry? Should I Feel Guilty About Laughing at Its Jokes? The Westboro Baptist Church are for real. As bad as they make conservative Christians (almost all of whom want nothing to do with them) look, they are for real (and they protest at funerals) and hence merit being discussed. But this site -- as far as I understand -- is not real, but a parody. I admit, at first read, I found much of what I read funny (like I do Fred Phelps). But if it's not real, is it ethical to poke fun or is it like a minstrel show for evangelicals? Yesterday my wife was cooking dinner as usual. When the dinner was ready I went to call my younger son but when I opened the door he sat naked on his bed masturbating over a pornographic magazine! Of course I gave him a hard beating and made him pray to the LORD until bedtime. Me and my wife are in shock, I have beaten my sons all their lives but sometimes they don't seem to understand the will of God. I am very concerned about this and I simply don't know what to do. I have always given them a daily spanking before bedtime but I feel like they need more beatings so they can seriously feel God's anger. Should I beat them more often or is there a better way to make them understand? As it stands, he is on his way to an eternity of searing pain being burned in hell. Do whatever you think it takes to get that sin out. No beating you can do will be as bad as what God has in store for kids who don't get the devil off their privates. The Volokh Conspiracy discusses legal scholar Philip Hamburger's work in progress that argues the 14th Amendment doesn't properly incorporate the Bill of Rights against the states. This particular thread has an illuminating discussion on the matter. Hamburger's article is timely because SCOTUS may decide whether the Second Amendment incorporates against the states. And he is a heavyweight (he currently teaches at Columbia Law, formerly of U. Chicago) who has been cited by the Supreme Court. One pro-incorporation of the 2nd Amendment commenter at Volokh accused Hamburger of playing into the Left's hands, giving the Liberal judges fodder for holding the 2nd Amendment doesn't properly incorporate. But, I don't see how this is true. Hamburger argues against the notion of incorporation entirely. That is, he wants the entire thing undone including the First Amendment, hardly a lefty-liberal idea. But, the dilemma for someone in his position is, what is the Court to do where unincorporating the entire Bill of Rights isn't an option? By way of analogy, I hold to the libertarian position on anti-discrimination laws and that is anti-discrimination laws ought not apply to the private sector, but to public entities only. Yet, sexual orientation SHOULD be on that list of categories along with race, gender, religion, age, disability, that government can't discriminate against. If we are going make an exception for ONE category that SHOULD apply to private entities, it would be race and race only. Not color. Not ethnic origin because the Irish didn't suffer chattel slavery. Certainly not religion, which is entirely mutable, a matter of choice. As it stands, if a gay boss at a private firm finds out one of her workers is an evangelical Christian and fires him for that reason, under federal anti-discrimination laws the Christian can sue. But if the Christian boss finds out one of his workers is gay, that's legal at the federal level. This kind of system where conservative evangelicals get "special rights" under anti-discrimination laws that apply to the private sector that homosexuals don't seems blatantly unfair. It violates equality. So what is a libertarian to believe? That we ought to further limit economic liberty by extending anti-discrimination laws to a new category that affects private groups? OR that we add sexual orientation to the list, because, if we are going to have such laws that apply to the private sector, it makes no sense to have a list that covers, not just race, but age, disability, religion, but not sexual orientation? Likewise, what is someone like Philip Hamburger to believe on incorporating the Second Amendment against the states? Do we further extend (what he sees as) error? Or do we stop the further error and stick with a system where certain parts of the BOR (i.e., the First Amendment) are incorporated, but the Second is not? Remember, UNINCORPORATING the entire BOR is not on the table for those faced with this dilemma. If I were in Hamburger's shoes, I'd argue if we have to have incorporation, it makes no sense NOT to incorporate the Second. Likewise, I believe if we have to have anti-discrimination laws that apply to the private sector, sexual orientation should be included. 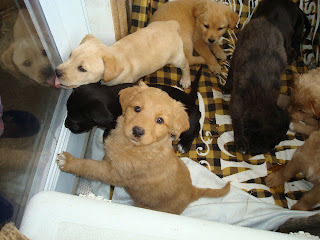 An old friend found these puppies abandoned on the side of the road in the suburban Philadelphia area. If you want to adopt one, give me an email and I will forward it on to him. The culprits are Tim Pawlenty, governor of Minnesota, Dan Kennedy, assistant professor of journalism at Northeastern University, and David Limbaugh, writer, author, attorney, and brother of Rush. "... God is in charge ... In the Declaration of Independence it says we are endowed by our creator with certain unalienable rights. It doesn't say we're endowed by Washington, DC, or endowed by the bureaucrats or endowed by state government. It's by our creator that we are given these rights." Pawlenty misused because he is a conservative evangelical Christian and the God of the Declaration of Independence is arguably not that of evangelicals and doesn’t vindicate their ideal vision for society. That document doesn't mention Jesus Christ or quote verses and chapters of scripture. Its call to revolution is arguably in tension with Romans 13. And it's not clear that other central principles enunciated in the Declaration have anything to do with the Bible. Next we have Dan Kennedy's article on Pawlenty speech featured in the British newspaper The Guardian. "While we assert for ourselves a freedom to embrace, to profess, and to observe, the religion which we believe to be of divine origin, we cannot deny an equal freedom to them whose minds have not yielded to the evidence which has convinced us," wrote James Madison. In contrast to Madison, the Republicans propose a theocracy of believers. It is an assault not just on anyone who isn't one of them, but on the American idea, and on liberal democracies everywhere. Kennedy's misuse is characterized by the phrase "overstating your case" or "hyperbole." Jefferson's Christianity may be subject to debate, but it is clear that he didn't view himself as expressing his own views in the Declaration; rather, "it was intended to be an expression of the American mind." (The American mind, it should be noted, was decidedly Christian.) Plus, a congressional committee led by the devout John Adams made more than 80 changes, deleting nearly 500 words and adding two references to a providential God. The Declaration was a corporate statement of Congress. Also, Jefferson was not present at the Constitutional Convention. So Kennedy's reference to Jefferson is at best misleading, as is his convenient omission of many other relevant facts – including that 52 of the 56 signers of the Declaration and 50 to 52 of the 55 signers of the Constitution were orthodox Trinitarian Christians. First, Jefferson may well have believed the DOI an "expression of the American mind." But nothing suggests Jefferson believed in an "expression" that at all contradicted his personal political theological convictions. Jefferson -- that unitarian rationalist he -- thought such an "expression of the American mind" entirely compatible with his personal theology that rejected every single tenet of Christian orthodoxy, the infallibility of the Bible, eternal damnation, etc. 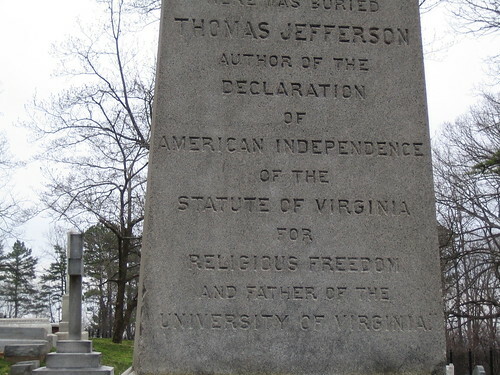 Jefferson so embraced the final version of the DOI that he lists his authorship of it as one of his three proudest accomplishments on his tombstone. Second, Limbaugh falsely contrasts John Adams' "devout" nature with Jefferson's. In reality, the two possessed the same unitarian rationalistic creed that rejected orthodox Christian doctrine, the infallibility of the Bible, eternal damnation, etc. Finally, Limbaugh passes phony statistics about the "orthodox" nature of the signers of the Declaration and signers [sic] of the Constitution. The notion that 50-52 of the men who attended to Constitution Convention (only 39 singed!) were "orthodox Christians" is bunk. A scholar -- the late ME Bradford -- asserted this and he based it entirely on some kind of formal or nominal connection to a Christian Church that professed "orthodoxy." The 52 of the 56 figure that relates to the Declaration of Independence results (likely) from a mistake some activist made, confusing Bradford's "52 out of 55," that was meant to discuss the US Constitution, with the signers of the Declaration of Independence. The truth is, we know a handful of very important Founders (Jefferson, J. Adams, Franklin,) explicitly rejected orthodox Christian doctrines, a handful of important Founders (Washington, Madison, G. Morris, Wilson, Hamilton before the end of his life) were, after meticulous study, not provably orthodox Christians during the time in which they founded America; they went out of their way not to give rope to hang their good reputations with (which leads me to believe they were close to the heterodox rationalist camp than the orthodox camp). And a handful of second tier Founders (Jay, Henry, Witherspoon, Boudinot, Sherman) were provably orthodox Christians (but even they flirted with heterodoxy and rejected Sola Scriptura). There were a number of important second tier Founders like Paine, Allen and Palmer who were strict Deists. And with the great many of other lesser Founders, we just don't know enough to be certain. Proving they had some kind of connection to an orthodox Church -- as Bradford did to prove the Founders' "orthodoxy" -- shows nothing more than they could have been as orthodox as Patrick Henry or heterodox as Thomas Jefferson. In case anyone is interested, one of my group blogs, Positive Liberty, has, of late been going through technical problems. 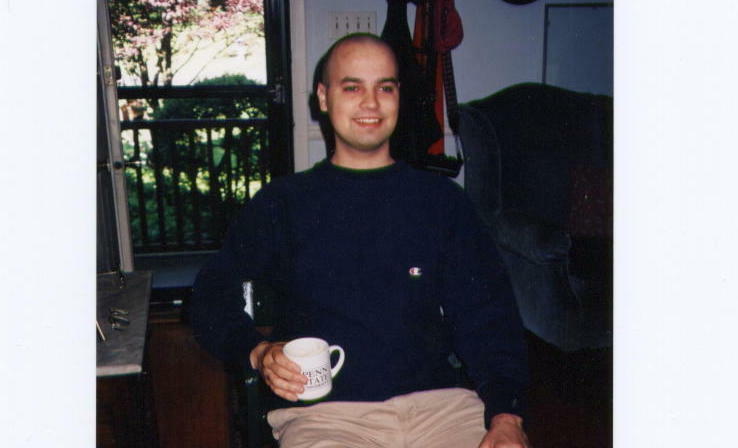 The site's founder, my friend Dr. Jason Kuznicki has given up, lest he pull all of his hair out and become bald like me, and joined this very estimable other group blog. Check that link for more information. If you go to the site Positive Liberty, some squatter now resides there. The good news is the rest of us libertarians (or is it "we" libertarians; I think this is a place where both "us" and "we" work within the prescriptive grammatical rules) who blog there plan to stick together. We just aren't yet sure whether we will continue to use the name "Positive Liberty" because our URL has been hijacked. Update: We are back for now. We will probably go through significant future changes. Again, I'll keep you posted. At American Creation, Tom Van Dyke has a post that features a letter of WILLIAM E. CHANNING, Minister of the Church of Christ in Federal Street, Boston (one of the most notable American Unitarians of that era) to TO THE REV. SAMUEL C. THACHER, circa 1815. The perennial question is whether "unitarianism" (the name of the theology) or "Unitarianism" (the name of the Churches) qualifies as "Christianity" as it claimed it did. "I fear, that the Author of the Lord's prayer will, according to this rule, be driven as a heretick from the very church which he has purchased with his own blood. In that well known prayer I can discover no reference to the "inspiration of the holy scriptures, to the supreme divinity of the Son and Holy Ghost, to the atonement and intercession of Jesus Christ, to the native and total depravity of the unregenerate, and to the reality and necessity of special divine grace to renew and sanctify the souls of men;" and these, let it be remembered, are _five_ out of the _six_ articles which are given by the Reviewer as fundamental articles of a christian's faith." "The word UNITARIANISM, as denoting this opposition to Trinitarianism, undoubtedly expresses the character of a considerable part of the ministers of this town and its vicinity, and the commonwealth...We both agreed in our late conference, that a majority of our brethren believe, that Jesus Christ is more than man, that he existed before the world, that he literally came from heaven to save our race, that he sustains other offices than those of a teacher and witness to the truth, and that he still acts for our benefit, and is our intercessor with the Father. This we agreed to be the prevalent sentiment of our brethren." To many of the "orthodox" of today and back then, unitarianism is not "Christianity" whatever it calls itself. Ironic in that many/most "Christian Nationalists" are orthodox Christians who likely would term non-Trinitarianism as "not Christian." But if unitarians are "Christians" then that captures a lot more notable Founders (Jefferson, J. Adams, Franklin, probably Madison, and contemporaries of Channing, Joseph Story and Jared Sparks) as "Christians." That would bring us closer to a "Christian" Founding. I thank you for Mr. Channing's discourse, which you have been so kind as to forward me. It is not yet at hand, but is doubtless on its way. I had received it through another channel, and read it with high satisfaction. No one sees with greater pleasure than myself the progress of reason in its advances towards rational Christianity. When we shall have done away the incomprehensible jargon of the Trinitarian arithmetic, that three are one, and one is three; when we shall have knocked down the artificial scaffolding, reared to mask from view the simple structure of Jesus; when, in short, we shall have unlearned everything which has been taught since His day, and got back to the pure and simple doctrines He inculcated, we shall then be truly and worthily His disciples; and my opinion is that if nothing had ever been added to what flowed purely from His lips, the whole world would at this day have been Christian. I know that the case you cite, of Dr. Drake, has been a common one. The religion-builders have so distorted and deformed the doctrines of Jesus, so muffled them in mysticisms, fancies and falsehoods, have caricatured them into forms so monstrous and inconceivable, as to shock reasonable thinkers, to revolt them against the whole, and drive them rashly to pronounce its Founder an impostor. Had there never been a commentator, there never would have been an infidel. In the present advance of truth, which we both approve, I do not know that you and I may think alike on all points. As the Creator has made no two faces alike, so no two minds, and probably no two creeds. We well know that among Unitarians themselves there are strong shades of difference, as between Doctors Price and Priestley, for example. So there may be peculiarities in your creed and in mine. They are honestly formed without doubt. I do not wish to trouble the world with mine, nor to be troubled for them. These accounts are to be settled only with Him who made us; and to Him we leave it, with charity for all others, of whom, also, He is the only rightful and competent Judge. I have little doubt that the whole of our country will soon be rallied to the unity of the Creator, and, I hope, to the pure doctrines of Jesus also. Even polished writers screw up who v. whom, so much so that the prescriptive rules on it may change. Frank Mir's longstanding grudge with Brock Lesnar shows no signs of dissipating, and in a radio interview last week, Mir raised the stakes by saying that if he gets a third fight with Lesnar, he'll be motivated by a desire to break Lesnar's neck and see him die in the Octagon. "A lot of individuals are so worried about being politically correct," Mir said in an interview with Mark Madden on WXDX radio. "I'd rather go ahead and say what's on my mind than to sit there and come up with some PC 'Oh, the guy is a great fighter and I have a lot of respect for him.' If I don't mean it, why is it even coming out of my mouth? ... I want to fight Lesnar. I hate who he is as a person. I want to break his neck in the ring. I want him to be the first person that dies due to Octagon-related injuries. That's what's going through my mind." Those comments are unfortunate, and they don't reflect the good sportsmanship that Mir usually espouses. Perhaps Mir is just trying to play up his rivalry with Lesnar, but he says he truly hates Lesnar, whom he beat in 2008 and who beat him in 2009. During America's Founding era, and today, "Christianity" and "Deism" didn't have univocal meanings, part of what makes the "Christian Nation" debate tough but interesting. A friend emailed arguing for a broader definition of "Deism." Indeed, scholars have used terms like "warm Deism," or "Providential Deism" to describe the religion of Washington, Franklin, etc. Thomas Jefferson, from what little he wrote on Deism, seemed to endorse a very broad understanding of Deism, that is belief in one God. He wrote of the "Deism" of the Jews. II. JEWS. 1. Their system was Deism; that is, the belief of one only God. But their ideas of him & of his attributes were degrading & injurious. 1. [Jesus] corrected the Deism of the Jews, confirming them in their belief of one only God, and giving them juster notions of his attributes and government. Jefferson's understanding of "Deism" is arguably too broad to be meaningful. And, also arguably, an understanding of "Christianity" that holds anyone who calls himself a Christian (even if an agnostic or an atheist) is too broad to be meaningful. Scholars can also unfairly play the broad/narrow game to unfairly claim the religion of the American Founders for the side they desire. ... One unfair thing scholars from both sides do is read one term broadly and the other narrowly to try and “capture” a Founder for each respective side. The broad understanding of Deism includes belief in an active personal Providence. The broad definition of Christianity includes anyone who call himself a Christian or is formally/nominally associated with a Christian church. The narrow definition of Deism means belief in a non-intervening God. The narrow definition of Christianity requires strict adherence to the orthodox Trinitarianism found in, for instance, the Nicene Creed. Broadly understood, the “key FFs” (the first 4 Presidents, Ben Franklin and a few others) were both “Christians” and “Deists.” Hence David Holmes’ term “Christian-Deism” to describe their creed. Narrowly understood they were neither. Hence terms like “unitarianism” or “theistic rationalism” to describe this creed. ---And the old standby, What is "Christian?" Can you be "Christian" if you believe the Bible is the direct Word of God? If you believe Jesus is the Messiah, although not the Second Person of the Holy Trinity? ---And who decides the answer to this question? Trinitarian clergy? Theologians? Sociologists? Historians? ---Was there a God of the Founding? ---Is this "theism," or is "theism" just a slippery term for what is the uniquely monotheistic, providential Creator-God who endowed men with certain unalienable rights, one who is unmistakably "Judeo-Christian," at least compared to all of man's other gods? ---What might Judeo-Christian mean? Anything? Everybody seems to know what it means, so does that mean anything? 3. What is Xnty ? Courts of law to Judge. 4. What edition: Hebrew, Septuagint, or Vulgate ? What copy what translation ? 5. What books canonical, what apocryphal ? the papists holding to be the former what protestants the latter, the Lutherans the latter what the protestants & papists ye former. 6. In what light are they to be viewed, as dictated every letter by inspiration, or the essential parts only ? Or the matter in general not the words ? 8. Is it Trinitarianism, Arianism, Socinianism ? Is it salvation by faith or works also, by free grace or by will, &c., &c.
9. What clue is to guide [a] Judge thro' this labyrinth when ye question comes before them whether any particular society is a Xn society ? 10. Ends in what is orthodoxy, what heresy. Dishonors Christianity. By this time many leading light "Protestants," Madison perhaps among them, began to argue things like Arianism, Socinianism, salvation through works, and a Bible where only the "essential" parts (not the whole thing) were inspired, under the auspices of "Christianity." Yet others -- the "orthodox" -- maintained believers in these positions "whatever name they take are no Xn Society." Madison didn't want judges resolving this issue. And they would if government gave aid to "Christianity" generally but not "other" religions. If the Supreme Court ruled the Constitution permits aid to "Christian" but not other religions, one easy solution would be simply call yourself a "Christian" and get that aid. You can be an atheist, a Muslim, a Jew, just call yourself a "Christian" and you are eligible for government support. And that relates to another dynamic behind the "Christian Nation" debate. No one argues America wasn't and isn't a "Christian nation" in a nominal or demographic sense. No one argues, for instance, the Founders were predominantly Muslim. 98% of Americans thought of themselves as "Christians" as do roughly 80% today. These include, not just Pat Robertson and the Pope, but Chris Hedges, Andrew Sullivan (who it might surprise you, is orthodox in his Christology), Barack Obama and Mitt Romney. Plenty of deistic and agnostic minded folks consider themselves "Christians" for heritage, cultural and demographic reasons. I am a baptized Roman Catholic (but went no further). Arguably, I could, but I don't, call myself a "Christian-Agnostic." Or a non-practicing Roman Catholic-agnostic. Rather, we argue over a tighter, more meaningful definition of "Christian," AND how "Christianity" (however that theology defines) informed the principles of the Declaration of Independence, the US Constitution, and Federalist Papers and other aspects of life during Founding era America. Further, we argue over how the Founders THOUGHT government and religion should intersect. Check out her latest Huffington Post entry here. Gary Scott Smith on "How Christian Were the Founders?" 3). I have no idea where Barton gets the idea that 29 of the signers of the Declaration of Independence held "seminary" and "Bible school" degrees. How does he define "seminary" and "Bible school?" These kinds of institutions did not exist in the eighteenth-century. 6). Barton fails to mention that Benjamin Rush spent a portion of his adult life as a universalist. 8). Barton is wrong about the so-called "prayer meetings" at the Constitution. Franklin did call for prayer at the Constitutional Convention, but his proposal was rejected. 9). Barton is wrong when he claims that the 1782 Aitken Bible was printed by the Continental Congress. The Congress actually turned down a proposal to publish Aitken's Bible, but it did endorse it once it was published. It was not funded by Congress. If you are interested in this kind of stuff, you might be interested in my forthcoming (probably January 2011) book: "Was America Founded as a Christian Nation: A Historical Primer." University of Colorado history professor Paul Harvey gives his thoughts on the recent New York Times article about the Texas schoolbook controversy (his post kindly links to one of my posts). ... Shorto covers the strategy of the Houston dentist Don McLeroy and other board members who are seeking "transformational change outside of the public gaze," meaning that the real war will be conducted in private with textbook publishers who have to take these general standards and condense them down into textbook bite-sized chunks. Their model is based on their previous assault on the state educational science standards -- failing to get in their intelligent design theories, they managed to get textbooks to incorporate language about the "strengths and weaknesses" of evolution as a possible "inroads to creationism." In their view, there has been a secularist conspiracy among experts to suppress "truth" in both science and history. Evidently, biology and history professors are united in an alliance to lead schoolchildren down the path of destruction, while the Texas activists seek "an uncovering of truths that have been suppressed." (My blog co-editor Randall Stephen's forthcoming book The Annointed: America's Evangelical Experts discusses the history of this idea, and the creation of an entirely separate evangelical intellectual universe, with great skill). Brad Hart at American Creation caught this. Check out Tom Van Dyke's comment for balance. The NYT, on February 11, 2010, featured a ten page article on the Texas State Board of Education controversy involving among others David Barton, Peter Marshall and Daniel Dreisbach. A version appears in the Sun. Magazine dated February 14, 2010, on page 32. It's titled, How Christian Were the Founders? Yep, that seems typical of the "Christian Nationalism" that I've long criticized. Randall Balmer, a professor of American religious history at Barnard College and writer of the documentary “Crusade: The Life of Billy Graham,” told me: “David Barton has been out there spreading this lie, frankly, that the founders intended America to be a Christian nation. He’s been very effective. But the logic is utterly screwy. He says the phrase ‘separation of church and state’ is not in the Constitution. He’s right about that. But to make that argument work you would have to argue that the phrase is not an accurate summation of the First Amendment. And Thomas Jefferson, who penned it, thought it was.” (David Barton declined to be interviewed for this article.) In his testimony in Austin, Steven Green was challenged by a board member with the fact that the phrase does not appear in the Constitution. In response, Green pointed out that many constitutional concepts — like judicial review and separation of powers — are not found verbatim in the Constitution. There's lots more great stuff in the NYT's article (I think I've excerpted enough). On the relationship between the Declaration of Independence and the US Constitution, historians, political scientists and legal scholars on the Left and the Right actually vigorously dispute the matter. Given the dispute, it's probably not a good idea for history books to take a side, but rather, do their best to "teach the controversy" (and unlike the case with Intelligent Design where you may have heard that line, there really is a compelling controversy here). Barton and company argue the DOI's status as "law" in an attempt to answer "The Godless Constitution" thesis. The problem is the DOI is not a Christian/biblical document -- at least not in the sense that the Christian Nationalists understand the concept. It doesn't mention Jesus Christ or quote verses and chapters of scripture. Its call to revolution is arguably in tension with Romans 13. And it's not clear that many/most of the important principles enunciated in the DOI have anything to do with the Bible. The DOI is obviously a Providential or theistic document (not necessarily a Christian or a biblical document). 8 out of 9 members of the Supreme Court (insofar as I correctly understand the newish Justices Alito's, Roberts' and Sotomayor's views) don't believe the Declaration of Independence is "law." Justice Thomas, btw, is the only member who does. And most conservative expert figures endorse the "DOI is NOT law position." Not only Justice Scalia (and the late CJ Rehnquist), but also former Judge Robert Bork, law professor Lino Graglia, the late conservative traditionalist Russell Kirk (who notably argued the DOI was a wink towards France to win their support against the British) and many others. I think they recognize calling for revolt on the grounds that God gives us the "right" to do so isn't exactly a settled position in traditional conservative Christendom and also may not foster the kind of orderly, traditionalist society they desire. Yes, a "revolutionary" current is fairly well established in Christendom. It's just not clear that revolutionary thought harmonizes better with conservative Christianity, than for instance, liberation theology. ... The Declaration, however, consists largely of a lengthy indictment of King George III. It is hardly the sort of thing you would expect to find in a nation's constitution. What it is, of course, is a document meant to justify revolution -- that is, illegal action. Having no human law to rely on -- being in defiance of authority -- revolutionaries necessarily come to rely on the law of God, who, happily, rarely issues a protest. I'm not sure whether Graglia is a Christian, but he could, if he wished, quote verses and chapters of scripture and distinguished orthodox theological arguments on behalf of his sentiment. Perhaps he, Robert Bork, Russell Kirk are wrong and perhaps the conservative Christians who reconcile the "Americanism" of the DOI with biblical Christianity are right. But, again, K-12 history books shouldn't pick a side in that debate and try to sell it to school kids as Barton wishes. Actually, this year (my fifth year teaching full time). It kicks in Fall 2010. At community colleges, we tend to get less "respect" than four year or graduate colleges. We also teach more (and I'd argue better). Because that's what we are paid to do. 15 credits is minimum semester load and many, like yours truly, teach overloads. As it were, we have less time to publish and publishing is not a job requirement. Yet, many of us do publish because, perhaps, we thought we'd end up at a four year college (I didn't think I would, btw) and/or otherwise have the interest and ability to publish. Again, no job pressure to do so. As far as I know, we get paid/benefits on par with four year schools (in many cases, we get a better deal). And if an untenured CC prof does a credible job teaching and serves on the requisite committees as expected, tenure is presumptive. (That is, you really have to mess up to not get it.) THAT really makes up for the lack of proper respect CCs get from some circles. With that said, we have sad, shocking stories like this that relate to being denied tenure at four year colleges. I remember when Daniel Drezner was denied tenure at University of Chicago. I learned more about how different schools have vastly different policies about who gets it and who doesn't. As far as I understand, at the Ivy League or top tier level, except for law (and perhaps some other schools of exception), it's presumptive that you DON'T get tenure, even if you teach well and publish a lot. What Dr. Drezner did -- when he made a lateral move from Chicago (a top tier school) to Tufts (a very good school, but not as prestigious as Chicago) -- is typical of the good professor who does his job but is nonetheless denied tenure at the ivy league level, for whatever reason. I'm just happy I don't have to worry about crap like that. But at Mount Vernon, I was struck by the lack of information about Washington's faith. Even the bookstore, with its dozens of volumes about the great man, doesn't stock many titles that deal with George Washington, the Christian. All this makes "The Life of Washington" an especially important book. Newly published by Attic Books, this rich historical treasure was originally published in 1842 by the American Sunday School Union (now known as the American Missionary Fellowship) and authored by Anna Reed – a niece of a signer of the Declaration of Independence. This is an amazing book! If liberal historical revisionism is considerably more than an annoyance to you, projects like "The Life of Washington" take on vital importance. It doesn't hurt that this little volume, produced by Attic Books' crack team of editorial, design and marketing professionals, has a vintage feel. From the rough-cut edges to the scan of the original pages, "The Life of Washington" is a look back in time (and, hey, at $16.99, it's a value-packed prize). Of course the primary value of this book is that it was originally produced much nearer to the time George Washington lived, so the history recorded here is accurate. When it was released in 1842, it proved to be one of the most widely read biographies of Washington. We know we are reading a 19th century book when we find in the opening of Chapter 1, "To give us the delightful assurance, that we are always under the watchful care of our almighty and kind Creator, He has told us that He notices the movements of every little sparrow; and as we are 'of more value than many sparrows,' He will surely ever care for us." Try finding such a line in one of our modern textbooks. Lefty historical revisionists would have none of that. If interested in the book, don't bother buying it, you can download it for free via googlebooks here. I read your WND article, posted today, on Washington. While you assert GW a "Christian," you offer no evidence for it. A book written in the mid 19th Cen. may offer valuable insights, but ultimately, it's the historical record that counts. Some/much of what was thought in the 19th Cen. has been rightly corrected (or to use that boogey word, "revised"). For instance, if you took a poll of Americans in the 1950s on Rock Hudson's sexual orientation, they would (probably) have wrongly termed him straight. "Revision" does not necessarily equal "wrong." Based on my exhaustive research of Washington's religion (I've read Peter Lillback's entire 1200 page book, footnotes and all, as well as countless other books and primary sources), the record shows GW was, like Jefferson, Franklin, and others, formally and nominally associated with "Christendom," i.e., he probably thought himself a "Christian" in an identificatory sense (though little evidence shows him calling himself a "Christian"). But NOTHING shows GW would pass an evangelical's test for "Christian." In 20,000 pages of Washington's recorded writings (the Fitzpatrick ed., http://etext.virginia.edu/washington/fitzpatrick/) in NONE of Washington's personal letters (where he often speaks of "God," "religion," "Providence," etc.) does he speak of Jesus Christ by person or example. And in only TWO of Washington's public addresses does he invoke JC by name or example. And both of these addresses were written by aides (but signed by GW). In short, NO EVIDENCE shows GW had a personal relationship with Jesus Christ, accepted Him as Savior, 2nd Person in the Trinity, believed the Bible the inerrant, infallible Word of God., etc. Evangelicals need to stop claiming Washington as a "Christian." In this article Leon Wieseltier, literary editor of The New Republic, attacks Andrew Sullivan relating to some beef that traces to Sullivan's leaving TNR (where he was the editor) some 14 years ago, about which I could care less. My estimable co-blogger at American Creation, Rev. Gary Kowalski, wrote a post on John and Abigail Adams' love letters and it touched upon their admiration of the Revs. Joseph Priestley and Richard Price. Hey it's better than no cheers. Some group called the National Legal Foundation filed an Amicus Curiae brief on behalf of David Barton's Wallbuilders in the case of PATRICK M. McCOLLUM v. CALIFORNIA DEPARTMENT OF CORRECTIONS AND REHABILITATION. Note, David Barton did not write the brief. Rather an attorney named Steven W. Fitschen did. Read the brief and/or google the case for the more specific facts of the case in controversy. I deal with the larger issue that is in dispute. And that is what the term "religion," as understood by the Founders, in the Constitution's "religion" clauses, means. In particular whether "religion" was meant to extend beyond monotheism. First, why the brief gets less than my full support: It argues that non-monotheistic religions were originally intended less than full "religious" rights under the Constitution. I disagree and the text of the Constitution supports my reading (but may support theirs too). Interestingly, I've heard some atheist advocates agree with a core tenet of Wallbuilders' argument. That is, the brief argues atheism is not a "religion" as America's Founders understood it, and consequently, not entitled to the constitutional protection that monotheism receives. Some atheists argue (albeit in a different context) indeed, atheism is NOT a religion, just as not collecting stamps is NOT a hobby. But the bottom line of the dispute: How the term "religion" -- as it appears in the First Amendment and Art. VI. Cl. 3 of the US Constitution [where the term "religious" is used] -- defines. The bottom line as I have concluded: "Religion" didn't have a univocal meaning. This illustrates problems with certain forms of "originalism." Parts of the text of the US Constitution use notoriously vague language. And certain forms of originalism argue "the text either means X -- intent or expected application, etc. -- or it means anything." What they don't note is that X can mean X1, X2, X3, and so on, all with results that vary or contradict one another. But, that doesn't mean X can mean anything. Take for instance, the Second Amendment. The right to bear arms, in a literal, originalist, textual sense, could mean an individual right to any arms the US government possess, i.e., even private nuclear missiles, if a very rich citizen manages to get them. Indeed, a chief concern of the framers and ratifiers of the Second Amendment was citizens have access to the same weapons the government does so they could potentially "check" an emerging tyranny. With religion, the text of the religion clauses supports a universalist reading that all religions or lack thereof are covered. "Religion" means "religion." Atheism, witchcraft, polytheism are "religions" and consequently covered. Did the Founders believe that? Well some did and some didn't. And some offer evidence at different times and places that could support different results. In short, religious rights apply universally. So why give this Wallbuilders' brief ANY credibility? In arguing that "religion" means at least monotheism it recognizes a degree of religious diversity that one doesn't expect from Christian Nationalist sources. For instance, on page 9, "research shows that 'religion' was sometimes used as a synonym for Christianity, but that it was also used for monotheism." This leads to the question of whether a belief in eternal rewards and punishments was an essential part of the Framers‟ definition of religion....The fact that a belief in eternal rewards and punishments was necessary for full participation in the body politic might lead one to conclude that such religions were a subset of a larger group of monotheistic religions. ... Various state constitutions guaranteed freedom for religion exercise but prohibited office holding for all but Protestant Christians. Id. Yet clearly, Catholics and Jews, who were targeted by such restrictions, fit within the rest of the definition of “religion.” Similarly, those who do not fear a possible future state of punishment might still fit the rest of the definition of religion. Such a group existed in early national America, namely the Universalists. In fact, this was one of the main points of opposition to the Universalists: “the Universalists by removing the fear of hell were supposed to reduce seriously the supports of morality.” XII New Schaff-Herzog Encyclopedia of Religious Knowledge at 96. Yet it is hard to imagine that the Framers would not have considered Universalism (as the term was used at that time) to be a religion, given the involvement of Universalists and men with universalist sympathies who helped organize the new nation. See, e.g., “John Adams,” http://www25.uua.org/uuhs/duub/articles/johnadams.html (last visited January 27, 2010) (article on the Unitarian Universalist Association‟s website discussing Adams‟ religious views, as well as those of various contemporaries. Articles for other Founders can be located on this site as well). Thus, it seems best to limit the definition of religion to monotheism. θεμις was the goddess of honesty, justice, decency, and right; the wife of Jove, another name for Juno. She presided over all oracles, deliberations, and councils. She commanded all mortals to pray to Jupiter for all lawful benefits and blessings. Now, is not this (so far forth) the essence of Christian devotion? Is not this Christian piety? Is it not an acknowledgment of the existence of a Supreme Being, of his universal Providence, of a righteous administration of the government of the universe? And what can Jews, Christians, or Mahometans do more? Even in his public writings, for instance his 1787 Defense of Constitutions of the United States Adams invokes pagan Greco-Romans like Zaleucus, who supposedly got his laws from Athena, as "plac[ing] religion, morals, and government, upon a basis of philosophy, which is rational, intelligible, and eternal, for the real happiness of man in society, and throughout his duration." At American Creation, my co-blogger Brad Hart writes about the James Wilson "find" that made front page news. I was struck, when I first read the story, whether anything "new" was really discovered. As I understand the story: The document -- a supposed first draft of the Constitution -- was already known by scholars, but buried in Wilson's archives because folks didn't quite understand its significance. Renowned James Wilson scholar Mark David Hall chimed in at American Creation's comments section on the document's significance or lack thereof and he pointed to the Historical Society of Pennsylvania's website posting on the matter. Other distinguished experts chimed in and gave their opinions in the comments section there. Here. No it's not the Turkey episode, but just as good. It's the alcohol reaction time episode. If we give the slightest attention to NATURE, we shall discover that with utility she is curious to blend ornament. Can we imitate a better pattern? Public exhibitions have been the favorite amusements of some of the wisest and most accomplished nations. GREECE, in her most shining era, considered her games as far from being the least respectable among her public establishments. The shows of the Circus evince, that, on this subject, the sentiments of GREECE were fortified by those of ROME. The commencement of our Government has been eminently glorious: Let our progress in every excellence be proportionably great. It will, it must be so. What an enraptured prospect opens on the UNITED STATES! Placid HUSBANDRY walks in front, attended by the venerable plough. Lowing herds adorn our vallies: Bleating flocks spread o’er our hills, Verdant meadows, enameled pastures, yellow harvests, bending orchards, rise in rapid succession from east to west. PLENTY, with her copious horn, sits easy-smiling, and in conscience complacency, enjoys and presides over the scenes. COMMERCE next advances, in all her splendid and embellished forms. The rivers and lakes and seas are crouded with ships. Their shores are covered with cities. The cities are filled with inhabitants. The ARTS, decked with elegance, yet with simplicity, appear in beautiful variety, and well-adjusted arrangement. Around them are diffused, in rich abundance, the necessaries, the decencies and the ornaments of life. With heartfelt contentment, INDUSTRY beholds his honest labors flourishing and secure. PEACE walks serene and unalarmed over all the unmolested regions; while LIBERTY, VIRTUE and RELIGION go hand in hand harmoniously, protecting, enlivening and exalting all! HAPPY COUNTRY! MAY THY HAPPINESS BE PERPETUAL. How apt Franklin's sentiments were regarding modern advances in medicine. Founding era figures Timothy Dwight (President of Yale), Joseph Priestley and Richard Price all thought of themselves as "Christian." Dwight was "orthodox"; Priestley was Socinian; Price was Arian. As it were, all believed Jesus was Messiah and a risen savior. Dwight believed Jesus the Second Person in the Trinity; Priestley, Jesus only man, not divine at all, but on a divine mission; and Price, Jesus, a created but subordinate divine Son, the first created being. The "orthodox" like Dwight accused unitarians like Priestley and Price of believing, by necessity, in a partially inspired, that is fallible Bible. That's how, the orthodox argue, unitarians derive a non-Triune God from revelation. ... Dr. Priestley says expressly, that he does not consider the books of Scripture as inspired, but as authentic records of the dispensations of God to mankind; with every particular of which we cannot be too well acquainted. The writers of the books of Scripture, he says, were men, and therefore fallible. But all, that we have to do with them, is in the character of historians, and witnesses, of what they heard and saw: like all other historians, they were liable to mistakes. "Neither I," says he to Dr. Price, "nor, I presume, yourself, believe implicitly every thing, which is advanced by any writer in the Old or New Testament. I believe them," that is, the writers, "to have been men, and therefore fallible." And again; "That the books of Scripture were written by particular divine inspiration is a thing, to which the writers themselves make no pretensions. It is a notion destitute of all proof, and that has done great injury to the evidence of Christianity." The reasonings of the divine writers, he declares, we are fully at liberty to judge of, as we are those of other men. Accordingly, he asserts St. Paul in a particular instance to have reasoned fallaciously; and maintains that Christ was both fallible and peccable. Other English Socinians unite with Dr. Priestley in these sentiments: while Socinians of other nations proceed so far, as to treat the writers themselves, and their books, with marked contempt. In these several things there is plainly an utter denial, that the Scriptures are a Revelation from God. To all these opinions Dr. Priestley was once directly opposed: for he was once a Trinitarian, and a Calvinist. The inference seems, therefore, to be necessary, that he was led to them all by his denial of the Deity of Christ. A similar transformation appears to have been undergone by many other Socinians; and something very like it by no small number of Arians. I've long argued that the "Christianity" of Priestley and Price -- what they termed "rational Christianity" -- is closer to what the "key Founders" (Washington, J. Adams, Jefferson, Madison, Franklin, and others) believed than is the "Christianity" of the "orthodox" like Dwight.